So, did you hear the one where Obama, Putin, Elvis and Michael Jackson walk into a bar? P.S. Kinda screams "CAPTION ME! "...so please do, in the comments. There is a bad joke in there somewhere!! I don't have one but that's a neat freaky picture. That's a fab find & capture, Kath! I need to get a blogging calender and write your Son-ography Challenges - love to follow yours and Nicki's images to these songs! Wonderful looking puppets, I remember having some like this as a child! 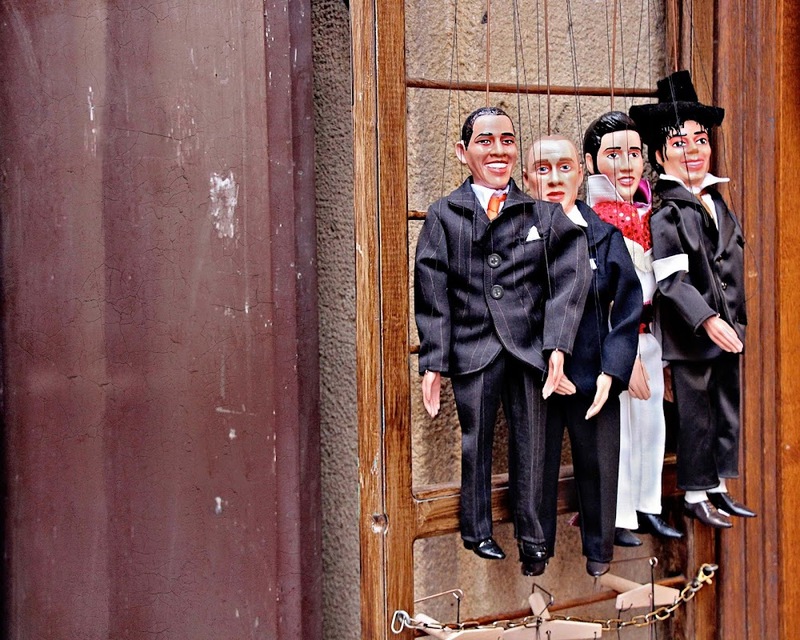 Wow, what a bunch of stiffs..........:) I have always loved puppets. When my granddaughters were babies I bought all kinds of puppets to play with them. As they grew up, they always put on a puppet show for Nana (me) when they came to visit. I ended up passing them down to them in later years. I would be very surprised if either of them still had one. are all hands accounted for? You find the neatest stuff. What comes to mind is Jailhouse Rock. lol. Great find. I am not clever enough to give a good caption, but...it is a funny pairing of characters! Kinda creepy, but a great find none the less! Yesm a bit creepy, but it's exactly what makes this photo perfect! Man.. There has to be a great punch line.. Think.. Think.. Think... Great photo my friend. Now that is an interesting mix of personality! "Cult of Personality"? awwww, I read the comments, I was hoping for some clever captions!! I don't have one and I am not so good at that but I think the puppets are awesome. Very life like, for puppets that is! !